READY, AIM, FIRE! The new Firetek Crossbow from Zing is one of the latest additions to Zing’s popular Firetek brand. Now blazing with LED light up power, the Firetek Crossbow’s illuminating effect is perfect for any type of target practice! Place the arrow hooks through the Crossbow loops and latch onto the pin. 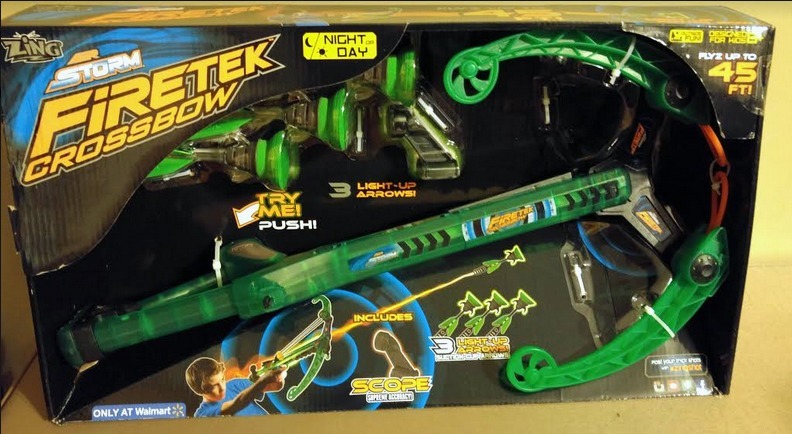 Release the safety, pull the trigger and watch the Firetek Dartz fly with amazing light up power! With arrows shooting over 45 feet and a special scope for supreme accuracy, your target doesn’t stand a chance with the Firetek Crossbow. Each Firetek Crossbow comes with one Firetek Crossbow and three suction-cup arrows. It is so easy to use, just place the arrow hooks through the crossbow loop and latch it onto the pin. Release the safety, pull the trigger and watch the Dartz fly. The Firetek Crossbow from Zing comes with three Dartz that have suction cup arrows (yes they do stick to windows, if your child accidentally shoots at one) and one Crossbow. The Firetek Crossbow shoots over 45 feet with supreme accuracy. Arrows light up and stick to any flat surface and self-release after 10 seconds! Your dogs will also love to chase the arrows as they fly, just don't let them chew on them!